The Masdar Initiative is an environmental urban ambition by Foster + Partners to develop a sustainable city. They recently released these beautiful images of their conceptual walled city where residents would enjoy a carbon and waste-free environment. The 6 million square metre project is based on the principles of an ancient walled city, combined with modern alternative energy technologies. The mixed-use, high density city will include a University, Innovation Center, Company Headquarters and several economic zones. The company plans to launch the project at Cityscape Abu Dhabi 2007. The initiative is being driven by the Abu Dhabi Future Energy Company. There are critics who say that the city appears cold and uninviting, like a computer microchip. However, the fact remains that this project will be a world first, and that it “promises to question conventional urban wisdom at a fundamental level. 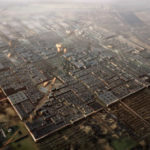 Masdar promises to set new benchmarks for the sustainable city of the future.” The city will be entirely self-sustaining! William McDonough and Dr. Michael Braungart founded MBDC in 1995 to promote and shape what they call the “Next Industrial Revolution” through the introduction of a new design paradigm called Cradle to Cradle Design, and the implementation of eco-effective design principles. Cradle to Cradle Design is a fundamental conceptual shift away from the flawed system design of the Industrial Revolution. Instead of designing products and systems based on the take-make-waste model of the last century (‘cradle to grave’), MBDC’s Cradle to Cradle Design paradigm is powering the Next Industrial Revolution, in which products and services are designed based on patterns found in nature, eliminating the concept of waste entirely and creating an abundance that is healthy and sustaining. Eco-Effectiveness is MBDC’s design strategy for realizing these results by optimizing materials to be food either for nature’s ecosystems or for humans’ industrial systems—perpetually circulating in closed systems that create value and are inherently healthy and safe. The Next Industrial Revolution is the emerging transformation of human industry from a system that takes, makes, and wastes to one that celebrates natural, economic, and cultural abundance. • Buildings that, like trees, are net energy exporters, produce more energy than they consume, accrue and store solar energy, and purify their own waste water and release it slowly in a purer form. • Factory effluent water that is cleaner than the influent. • Products that, when their useful life is over, do not become useless waste, but can be tossed onto the ground to decompose and become food for plants and animals, rebuilding soil; or, alternately, return to industrial cycles to supply high quality raw materials for new products. • Billions, even trillions of dollars worth of materials accrued for human and natural purposes each year. • A world of abundance, not one of limits, pollution, and waste. Welcome to the Next Industrial Revolution. During the spring of 1999 Ford Motor Company announced the long-term, $2 billion restoration of its 1,100-acre Rouge River plant in Dearborn, Michigan. Following a design paradigm developed by William McDonough, Michael Braungart, and their teams at MBDC and William McDonough + Partners, the project, said Ford chairman Bill Ford Jr., will “transform a 20th century industrial icon into a model of 21st century sustainable manufacturing.” It is one of the most sweeping, ambitious acts of industrial restoration ever. William McDonough + Partners was proposing an assembly plant with skylights for daylighting the factory floor and a 450,000 square-foot roof covered with growing plants. The “living roof,” in concert with a series of constructed wetlands and swales, would provide habitat for birds, insects and microorganisms, while controlling stormwater runoff. Grasses and thousands of trees would be planted to restore the soil. MBDC’s vision extended to the materials and the manufacturing processes used to make new cars. In the old industrial framework an environmental administrator’s first exercise is not to know anything-to try to do whatever is minimally required under the law to deal with the problem. The MBDC design paradigm turned that notion on its head: It offered Ford Motor a way to build a lean, effective, world-class manufacturing facility while restoring the Rouge Center landscape. In fact, the disciplined attention of MBDC and William McDonough + Partners to both business and the environment led to innovations that will make regulations obsolete, save money and enhance our productivity. The natural stormwater management system is a good example. The living roof and the swales, along with green space and porous paving, will replace traditional technical controls and potentially save Ford up to $35 million.